The February budget forecast reduced Minnesota’s projected surplus from $1.5 billion down to a measly $1.05 billion. In conjunction with this news, Gov.Walz is continuing to promote increased taxes, and reinstating the automatic inflators on statewide business property tax. He desires to increase taxes by a net $1.26 billion just in the general fund alone. Walz seeks a $7 billion increase in taxes over the next four years. I’m asking…how much is enough? Click on the photo above for the latest Capitol Happenings. 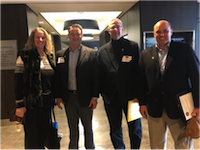 Thanks to Chris Glassing, American Ductile Iron Pipe; Mike Leahy, St. Paul Utilities; and Matt Brenteson, Brenteson Companies for joining me at MUCA’s Day at the Capitol. We met with several legislators from both sides and both houses. We lobbied for lower taxes, freedom from employer/employee mandates, and funding for infrastructure. It helps to educate your legislators on your business priorities! The Ad Hoc Code Review and Rulemaking Committee is considering a submission from the Minnesota Department of Labor to ban all use of Cured In Place Pipe (CIPP) as a valid method of repair for any and all size pipes in Minnesota. See the proposed “Request for Action” here. MUCA is gathering concerned members to oppose this effort. The next Ad Hoc Committee meeting is Monday, March 11 at 9 AM at the Dept. of Labor, 443 Lafayette Road N, St. Paul. Join us! Attention MUCA Member employees: If you have a senior in high school who will pursue further education after graduation (trade school, technical college or university), encourage them to apply for a MUCA Scholarship! Rain for Rent, LaTour Construction, and Larkin Hoffman Attorneys. Do you have a long term project approaching? Are you tired of constantly updating your Normal Tickets time and again to refresh all the marks? A Meet Ticket might be a better approach through staying in communication with the facility operators and locators for the duration of the project. MUCA, working with the Minnesota Common Ground Alliance and Gopher State One Call, produced a short one-minute video on the benefits of Meet tickets vs. Normal tickets. The Minnesota Laborers-Employers Cooperation & Education Trust (MN LECET) invites all union contractor representatives to join them as they ‘Celebrate Safety and Training’ at the Union Contractor Open House. Registration and tours begin at 9 AM. There is also a Safety Seminar offered 9-10 AM, with a program, contractor awards and luncheon to follow.